Wrapchic is on a mission to revolutionize the way we eat and enjoy our favourite Indian cusine. Creating and serving custom built burritos, bowls and salads, as well as their signature Wraplette (made to order Omelette wrap) or Wraposas (made to order samosas). 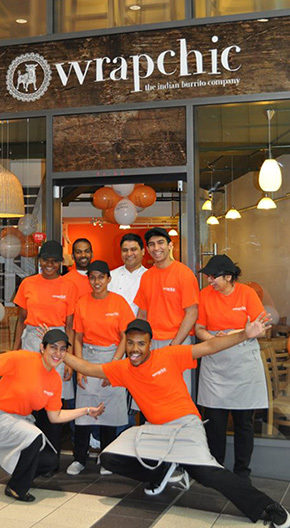 The first site opened in Central Birmingham in June 2012 with both eat in and take out options available/ Other sites have followed in Leicester and Coventry, with more outlets currently in the planning stage. Local deliveries are made using the Wrapchic tricycle. 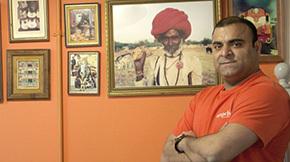 The founder, Mahesh Raikar, quit a well paid job with a fortune 500 company to create Wraphic. Mahesh was already well aware of all the possibilities provided by the most expensive EPOS software suites used by large companies with 100s or 1000s of sites, and wanted a solution he could use that was complete yet at the same time affordable and possible to deploy by himself without an IT team. Mahesh needed a solution that would allow all of the following: eat in sales, take away sales, integrated on-line ordering, and mobile sales. He also needed a solution that would give complete and detailed reporting on product sales in order to optimize his business, and that he could access from anywhere and on any device, including from his Apple IPad and Macbook. In the store there is a 10.1″ Android tablet mounted on a custom stand, with AlfaRichi AlfaPoint software, a networked receipt printer and a cash drawer. For mobile sales, a 4″ Samsung Galaxy smarphone is used to record sales, and for on-line sales, the AlfaRichi eCommerce package is used. Wherever he is, Mahesh can see up to date sales figures and has been able to use the detailed reports to understand which products and combinations of products are good sellers, as well as what different products are sold at different time periods during the day. He has also been able to optimize when staff are present at the shop by using the transactions by half hour report. Using an Android smartphone for mobile sales is an ideal solution, as the driver in any case needs to have a phone and can use the same device for recording sales and takings. Being able to manage the products for sale on the web site directly, from the same back office as traditional sales, has saved a lot of time and potential errors. After looking at many different EPOS solutions, Mahesh choose AlfaRichi because it gave him the detailed reporting features he needed in the back office as well as front end software that is easy for staff to use and works on both Android tablets for the shops and Android smart phones or small tablets for the mobile sales. In addition, there was the needed eCommerce integration which Mahesh saw as being ideally adapted to the sale of takeaway food, with the possibility of building the products on line in the same manner as in the restaurants. 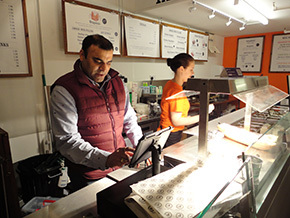 Mahesh originally wanted a standard15″ EPOS touch terminal. AlfaRichi have been our EPOS partener since our launch 8 months ago, We have had excellent support from AlfaRichi for our innovative concept. AlfaRichi’s web based EPOS solutions mean I can access sales information from any location on any device. I don’t have to be on site to access the variety of reports this software can create. We are currently expanding the business concept into a franchise model. AlfaRichi has really helped us with this as the same software solution will be replicated to other sites. AlfaRichi’s product is sleek, new and innovative, I am very much in favour of this being a long term partnership.